In his speech announcing a Justice Department lawsuit against the State of California, Attorney General Jeff Sessions suggested that the Golden State is treading the path of the confederacy. Condemning recent California laws enacted to impede federal immigration enforcement, Sessions said: There is no nullification. There is no secession. The states political leaders did not appreciate the comparison. Nevertheless, the attorney general has a point. Californias behavior today is reminiscent of the course charted by South Carolina in the nullification crisis of 1832, when John Calhoun previewed for the country the impulses and arguments that would later lead to secession and civil war. Responding to the so-called Tariff of Abominations, which many southerners held to be an unconstitutional use of the federal governments taxing power, South Carolina elected a special convention. That convention issued an ordinance purporting to declare the federal tariff null, void, and no law. The ordinance further declared it unlawful for anyone within the state, including federal officials, to enforce the payment of the taxes at issue. To be sure, California has not (yet) gone as far as South Carolina. Californias legislation does not formally claim a power to nullify federal immigration law. And even the boldest of its recently enacted laws does not make it illegal for federal officials to enforce federal immigration law. It rather stops short at making it unlawful for some businesses to cooperate voluntarilythat is, in the absence of a court orderwith federal immigration authorities. Yet there is one sense in which Californias position is even more extreme than that taken by the incendiary South Carolinians of 1832. After all, the proto-confederates at least claimed, however unreasonably, that the federal law they opposed was unconstitutional. Californias politicians, in contrast, do not assert the unconstitutionality of Americas immigration laws. They just dont want them to be enforced. Such differences aside, todays Californians are clearly acting in the same spirit as their nullifying predecessors. To borrow the words of the South Carolina Nullification Ordinance, Californias leaders seek, as much as they dare, to prevent the enforcement and arrest the operation of federal law. And their actions raise dangers similar to those that were highlighted by President Andrew Jackson when he condemned the 1832 Nullification Ordinance. In his Proclamation Regarding Nullification, Jackson warned that the ultimate tendency of South Carolinas arguments and actions was to destroy the Union itself. After all, if one state can declare a federal law unconstitutional and forbid its enforcement, then any state can declare any federal law unconstitutional and forbid its enforcement. At that point the country would have a government in name only, since the states would have to obey only those laws they saw fit to obey. The principle behind Californias actions today is almost as deadly. If California can make it unlawful for certain citizens to cooperate freely with federal immigration authorities, then any state can make it unlawful for any citizens to cooperate freely with any federal officials. As Attorney General Sessions noted, if California can take such steps to impede federal immigration enforcement, then other states can do the same to impede the enforcement actions of the EPA, the FBI, or any other federal agency. If such a system would not actually bring the federal government to a halt, it would at least unacceptably slow it down. Energetic execution of the laws was one of the key principles the Founders sought to attain by writing and ratifying the Constitution. Under the Articles of Confederation they had experienced the humiliations and dangers that arose from a government powerless to enforce its decisions. Thus they created a new government, limited in its scope, but fully empowered to carry its laws into effect without having to ask the permission of any state government. Just as the federal government cannot truly exist if states can nullify its laws, so it cannot achieve the energetic execution of law the Constitution is designed to secure if states can require federal officials to obtain a court order every time they seek the cooperation of ordinary Americans. Certainly neither California nor any other state would want its own officials to operate under such a burden. Leaving aside whatever we may think about immigration policy, this is not the kind of system that any sober citizen would want, or would think is contemplated by the Constitution. 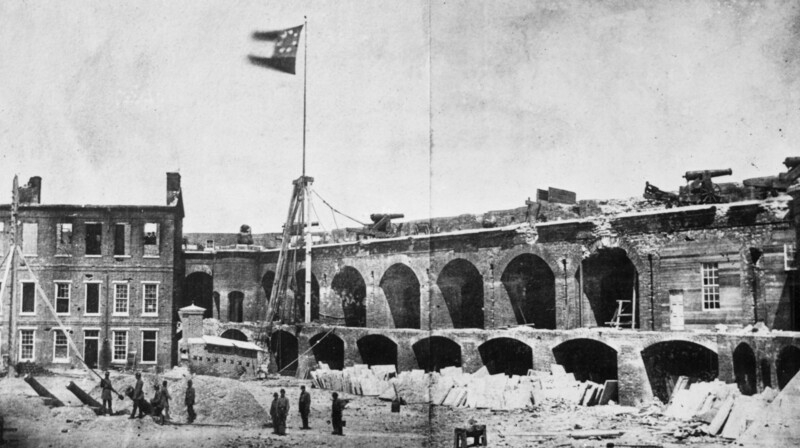 Interior of Fort Sumter after its capture by the Confederates in April 1861. Calhoun had a point......as did Jefferson and Madison when they wrote the Kentucky and Virginia resolutions in 1798. The states were and from the start were intended to be parties to the constitution - not mere administrative conveniences for the all powerful federal govt. In this case, Id be quite willing to let California or any other state go in peace if thats what their voters wanted. The union is supposed to be based on consent - not force, threats or violence. per article: "Sessions suggested that the Golden State is treading the path of the confederacy." Sorry Jeff, rebellion is not synonymous with "confederacy". A confederacy is a form of association. California is in rebellion. The only plausible confederacy California is involved in, would be a confederacy with Mexico. “Diversity” is wrecking America and the world. California is in open rebellion with the rest of the United States. The California government is openly defying federal law, the US Constitution, and has become a direct threat to the other US states. The California government has also been actively cooperating with and colluding with the mexican government to undermine US Constitutional authority to the detriment of the rest of the US states. The next mexican-american war will be fought in California. West Virginia became a separate state, as a result of Virginia declaring secession for the US. In 1859 California passed the Pico Act, requesting that Southern California be split off as a separate state. The governor signed the bill, and 75 percent of voters in Southern California voted for it as a referendum. Congress needed to approve the split. Because of the secession of Southern States, Congress did not vote on it. Bring back Californias Pico Act, and declare that since Congress failed to vote on Californias wishes in 1859, Congress will now take up the Pico Act. In the process, declare that since California has voted to ignore Federal Immigration Laws, and declared that anyone cooperating in the implementation of Federal Immigration laws will be arrested, the Legislature of the state of California is now in rebellion. Amend the original Pico Act and use the amended version to split California up into multiple states, to include the State of Jefferson in Northern California. Obama had no problem declaring that Arizona could not, on its own, enforce Federal Immigration law, and Arizona was ruled in violation of the Supremacy Clause. So isnt it true that California is in violation, since it refuses to enforce Federal Law, or cooperate with ICE in fulfilling their obligations under law? Is not the state of California Legislature in rebellion? Yes. the CA Legislature is in rebellion. Enforce the PICO ACT. Cut the state up into 4 or more pieces. Then do nothing to help them put the pieces together. Do not allow any of their immigrants into the rest of the USA. Disallow any noncitizens access to the USA. Isolate them. How much does it take to hoist libs on what is normally their favorite part of the constitution, the 14th? Seems to me that the City of Oakland doesn't have anyone "holding" the office of Mayor. Seems to me that a pack of other California offices also have gone vacant. Seems to me the votes of some Senators and Congresscritters shouldn't be counted any more than those of the illegals they defend. Seems to me that if any judges, including those of the 9th Circus or even wise Latinas say otherwise that President Trump should have more vacancies to fill. Maybe, politically, the time isn't quite right to pull the 14th trigger. But when the other side is eager to speak of succession and rebellion our side should be willing to point out that such tactics have been tried and failed in the past and that laws, including a constitutional amendment, were made specifically to prevent them in the future. Said laws don't say anything limiting them to ancient historical rebellions. "14th Amendment, Section 3" fits easily within the space limits of a tweet with plenty of room left for Trumpian embellishments! Getting folks to dig out a copy of the Constitution and read it is ALWAYS a good thing. Go for it, Mr. President! Oh ,and by the way, Section 5 says: "The Congress shall have power to enforce, by appropriate legislation, the provisions of this article." So the rebels can be removed, by action of the present simple majorities. Lincoln's Republicans would have done it! I wish ours were as "Radical." It seems to me that, under Mueller’s broadened concept of conspiring to defraud the United States, the Legislature and Governor of California are guilty of a felony, in that they have conspired to impede a federal officer in the performance of his duty. I had not known about the Pico Act...such a misfortune that Southern California was not split off. Pio Pico, the last Mexican Governor of California, was of mixed-race background (part African ancestry). So if a black politician gets elected governor of California, he or she won't be the first black governor of the state. According to the Wikipedia article, if Southern California had been split off, it would have been given the name Colorado (obviously before the name was applied to what is now the state of Colorado). Southern California was the jewel in America’s crown until just a couple of decades ago. No place on Earth with a better climate and coastline. Ain’t no reason at all to let the decrepit nation of Mexico try to take over. Used to be that kind of thing took us to War. And we won the last one we had with them over the territory. In this case, Id be quite willing to let California or any other state go in peace if thats what their voters wanted. How many of its voters would you be willing to allow to remove all the Federal property in California, along with all the U.S. citizens residing there who disagreed? Those in California who wanted to secede from the state....which would include all but the coastal strip from north of Orange County up to Oakland should also be free to then secede from California and rejoin the US if they so wished. Regardless, any state which leaves would have to take on its share of the national debt and/or pay for “improvements” to the land or other federal properties to be turned over. Obviously this would have to be negotiated. You do realize that the Chinese Navy will be in San Diego within six months of a California secession, and that Hawaii will go next, right?